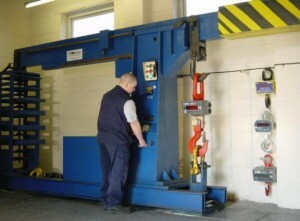 Crane Scales incorporating Phoenix Scales are an established, independent national weighing machine company. We offer a variety of services that include Hire, Service, Calibration, Repair and Sales of all makes and types of weighing equipment. A pioneer in the use and supply of electronic crane scales (suspended weighing), we are today the UK’s leader, marketing a range of unrivaled by any other company in our industry. All our calibrations are carried out by qualified engineers and we are externally audited by the BSI to ISO 17025 & ISO 9001:2008. 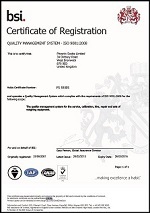 UKAS calibration accreditation gives your business credibility, legal protection, opportunities for future product development and will save you costs on re-testing products. Confidence in the market place is an important factor buyers take into serious consideration and are more likely to purchase products they can be assured to meet required standards of quality that have been regulated by a third party. The need for UKAS calibration accreditations to ISO/IEC17025 has never been more important for the future potential of your business. 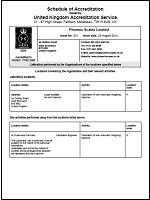 Phoenix Scales offer onsite UKAS accreditation services to factories and laboratories alike throughout the UK, combining calibration of pharmaceutical balances with factory production equipment for all types of businesses. 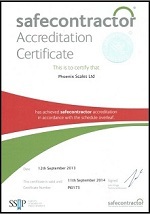 Phoenix Scales are accredited for ISO 9001:2008 & are certified for the self-verification (SV) of non-automatic weighing machines. This means that we can commission and calibrate weights and measures approved scales and equipment without having to wait for Trading Standards Officers to attend site. As an independent company established in 1979, providing and servicing the weighing needs of numerous leading and independent companies both here in the West Midlands and throughout the UK. As an independent concern, we are not constrained to supplying a particular manufacturer’s product, but can and do, supply and maintain numerous different types, makes and models.